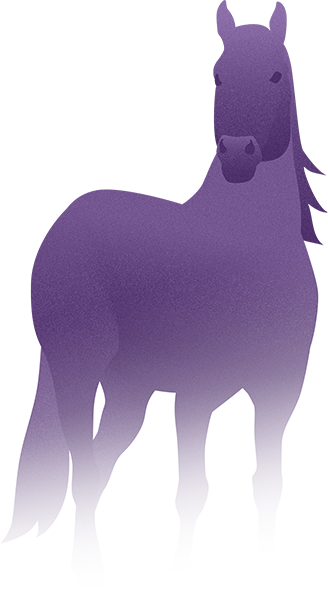 Tildren® (tiludronate disodium) will be administered to your horse through an intravenous infusion. It is administered over a 90-minute period. Tildren® is most effective when used in conjunction with corrective farriery and a controlled exercise program. Visit with your veterinarian to learn more about management and care after Tildren® has been given. In a controlled 6-month open use field study1, Tildren® (tiludronate disodium) was evaluated under strict conditions. Horses were observed for four hours following infusion and adverse events were recorded. The most common observations were clinical signs associated with colic, which are defined as outlined below. While colic may occur, clinical signs and incidence vary and may be intermittent. Pawing, getting up and down, pacing, restlessness, rolling, trying to roll, looking or biting at side, stretching out/straining, kicking at belly/walls, repeatedly shifting weight behind. 1 Freedom of Information Summary. NADA #141-420. Approved February 13, 2014. 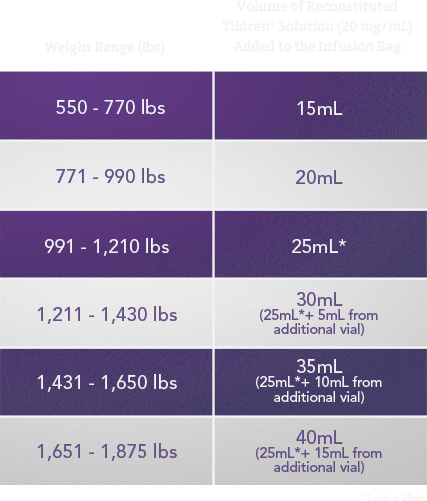 Tildren® is administered through a single intravenous infusion of 1mg/kg (0.45mg/lb) in 0.9% Sodium Chloride, and is given slowly and evenly over 90 minutes. Of the administered dose, 30-50% of the tiludronate disodium distributes to the bone within 12 hours of dosing. Bone concentrations are higher than plasma concentrations as early as 12 hours post-administration. The drug is slowly, but continuously, released in relation to the bone remodeling process and concentrations are still present at 6 months, but lower than at 3 months, in the bone.